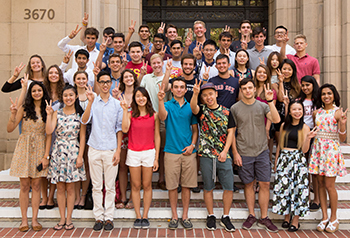 Students in the World Bachelor of Business program study on three continents and earn degrees from three universities through a partnership with USC, The Hong Kong University of Science and Technology and Bocconi University. The WBB allows students to learn from internationally renowned scholars through cultural immersion and real-world experiences. The first cohort of 45 WBB students will graduate in 2017. Photo by William Vasta of White House Photo, Inc. The Office of Executive Education offers two- to seven-day, non-degree professional development programs designed to help working professionals excel in their career. The Office of Executive Education is located at the AT&T Center in Downtown Los Angeles, (213) 740-8990; Fax (213) 740-6406 or email: execed@marshall.usc.edu.